So Trump is starting up a Presidential Committee on Climate Security as a counterpoint to various agencies (including the Pentagon) that view climate change as a national security threat. Chairing this committee would be one William Happer, a physicist and climate skeptic who said on CNBC in 2014: “The demonization of carbon dioxide is just like the demonization of the poor Jews under Hitler. 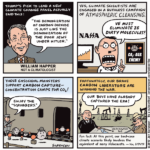 Carbon dioxide is actually a benefit to the world, and so were the Jews.” Later, he said “Demonization of CO2 and people like me who come to its defense is nothing to be proud of. 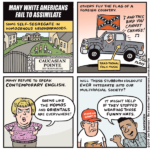 It really differs little from the Nazi persecution of the Jews, the Soviet extermination of class enemies or ISIL slaughter of infidels.” Sometimes when the fruit is hanging this low, it’s hard to resist drawing a cartoon about it. 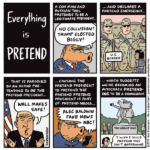 After writing a bunch of gags around Happer’s ridiculous analogy, it felt to me that the situation is far too dark to end the cartoon on a light, jokey note. Climate journalist David Wallace-Wells has been citing a study showing that we are at risk of 150 million premature deaths, or 25 Holocausts, from air pollution by the end of the century if we do not limit global warming to an extent that seems unlikely right now. Given Happer’s comments, it felt fitting to end with this more sobering comparison. In the SNL skit, Alec Baldwin (as Trump) refers to his “personal hell of playing president” and I thought I’d riff on that. I’m sure some will argue it’s incorrect to call Trump a pretend president, but when you’ve lost the popular vote and are only in office because of foreign interference, and are probably compromised by said foreign nation, then I think it is fair to say this is an illegitimate president. I’m in the process of updating the site, so if you see some broken bits here and there, that’s why. 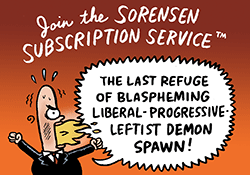 Of course, when you become a subscriber, the cartoon and commentary are luxuriously delivered to your very own inbox, thus allowing you to avoid the website altogether! Plutocratic putz Howard Schultz is often referred to as a “centrist” who is outraged at the “leftward” shift of the Democratic party, with special animus towards those Democrats calling for higher taxes on the super-wealthy. I am troubled by the rightward shift of our conception of the political “center” — the product of the right growing ever more extreme while the Dems have, over the years, tended to compromise in the name of bipartisanship. Defining the center as the halfway point between two parties without regard to policy specifics is both meaningless and insane. Even calling Schultz “socially liberal and economically conservative” makes no sense. The two are interrelated, with the latter undermining the former. I suspect many of my fellow lefties will recoil at the thought of being “centrist” in any way. But we need to buck the both-sidesism that creates false equivalence between progressive Democrats and the lunatics of the Trump administration.